Shell’s Project M. concept car. Image by Justin Leighton/Shell. 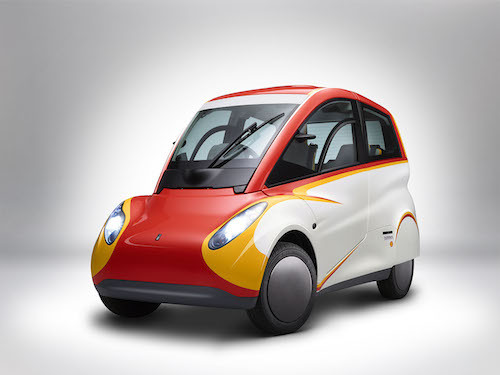 At a time when so many companies are developing self-driving vehicles, Shell, known as an oil company, has announced its new concept car, dubbed Project M. The tiny three-seat vehicle, designed mainly for urban environments, is a collaboration between Shell, Gordon Murray Design, and Geo Technology. It’s designed to be human-driven. The Project M car was designed using Gordon Murray Design’s iStream approach, which combines cradle-to-grave thinking, lightweight Formula One technology, low-carbon propulsion, adherence to strict safety standards and flexible manufacturing processes. The team created the car by thinking outside the box in the way they designed and produced it. It is built of “cutting-edge” lightweight materials, is 8.2 feet long, 5.2 feet tall, and weighs only 1,212.54 pounds. (In comparison, note that a 2016 Volkswagen Beetle is 14 feet long, around 4.8 feet tall, and weighs from 2,948 to 3,278 pounds, according to Google. And even the tiny two-seat Smart Car is 8.8 feet long, The Car Connection writes.) The Project M car’s body is made of recycled carbon fiber that costs a fourth as much as a steel car, and that can be recycled at the end of the car’s life. Several parts of the car were built using 3D printing technology. Although the car is small, it is not without safety features, like a rear-view camera, front and rear crush zones, and an “occupant safety anti-side intrusion system.” Side-view mirrors were left out, and instead there are cameras that display the view around the car on its dashboard. It can go at a top speed of 96.9 miles an hour, but the specifications page says that is restricted to 90 mph. Project M car would use a third less energy than a typical car driven in a city over its lifetime, and would take only half the energy to build and run of most small family cars. In tests it got an impressive 89.1 miles per gallon when driving 45 mph. Project M’s turning circle is 20 feet, smaller than that of a Smart Car. The team designed the car so that its body, energy, and lubricants would work synergistically. It uses a specially formulated motor oil to give it a 5% improvement in fuel efficiency. Drivers of the Project M car can use their smart phones to access a modified version of the Shell Driving App, which uses an on-screen graphic to give real-time feedback on the ways driving behavior affects fuel consumption.